Thank you for your interest in a Boat Insurancee quote. Since every insurance quote is specific to each person or business, it is important to speak to a live person. Please call us at 740-425-1012, or toll free: 800-407-1012. 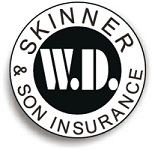 You may also send an email to agent@skinnerinsurance.com to get the process started. Please note that coverage via an email or voicemail request is NOT bound until you have received acknowledgement from our office.